While Brexiteers breathed a sigh of relief when Theresa May confirmed she would seek to partner up with the DUP, Express.co.uk has unearthed a shocking letter which shows the party's real motives and view on Brexit. 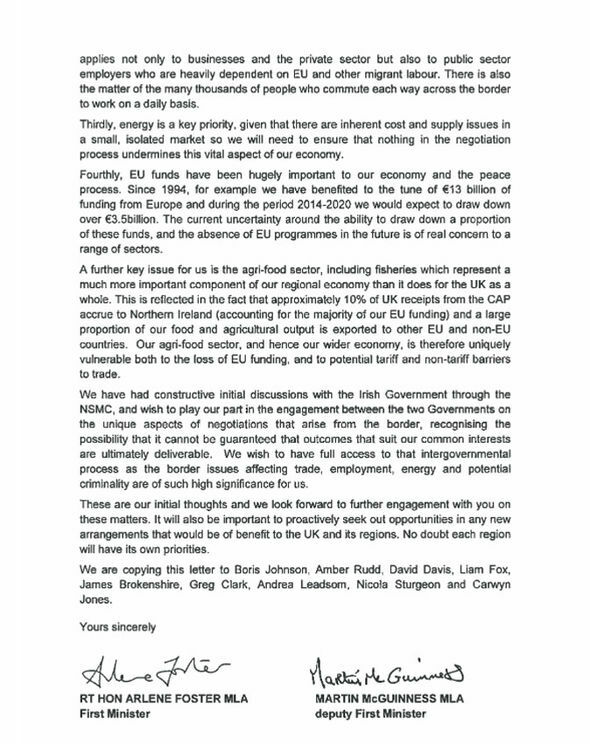 The letter written in August, penned by then First Minister of Northern Ireland Arlene Foster and her then deputy Martin McGuinness, makes numerous demands to maintain ties with the European Union (EU). They included freedom of movement rights and trade links. In the letter Ms Foster said: “It is critical to our economy that our businesses, both indigenous and FDI companies, retain their competitiveness and do not incur additional costs. “We therefore need to retain as far as possible the ease with which we currently trade with EU member states, and, also importantly retain access to labour. Prime Minister Theresa May scrambled for an alliance with the DUP after a shocking night at the polls, with Conservatives losing a total of 12 key seats. Mrs May said she had a “strong relationship with” the DUP. But Arlene Foster’s plans to keep freedom of movement within the Brussels club will undermine Mrs May’s for a hard Brexit to deliver the will of the people. Ukip MEP Bill Etheridge, who today threw his hat into the ring to become his party's next leader, attacked the alliance saying “any deal which included freedom of movement would not be Brexit”. He said:"Sadly Theresa May has put us in this situation with her decision to call that unnecessary election. "The British people voted for independence from Brussels and that means freedom to control our borders and the ability to trade with the rest of the world." The DUP bosses said Ireland relied on EU funds that have been “hugely important to our economy and the peace process”. Earlier this afternoon, Mrs May said would work with her "friends and allies" in the DUP. 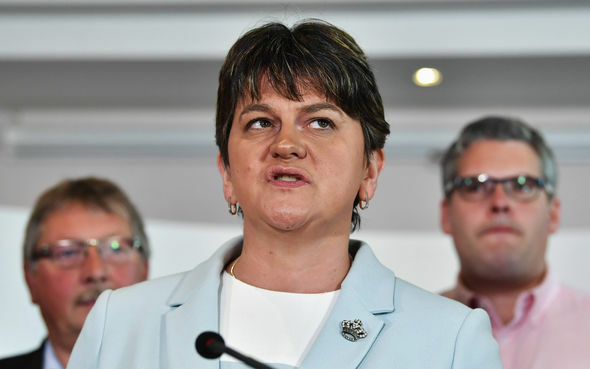 She added: "As we do, we will continue to work with our friends and allies in the Democratic Unionist party in particular. "Our two parties have enjoyed a strong relationship over many years and this gives me the confidence to believe that we will be able to work together in the interests of the whole United Kingdom." Comments by DUP leader Ms Foster and campaign video of Theresa May. First of all let me congratulate Theresa May with an almost impossible acheivement of maintaining the rudder and course of our ms Brexit. She has received far too much criticism and unfair statements,even from her own. What many people do not realize is the impredictable outcome of a combination of a normal election infused with Brexit. It has never happened before. It was a daring venture,which almost went wrong, and as such,also had some casualties. 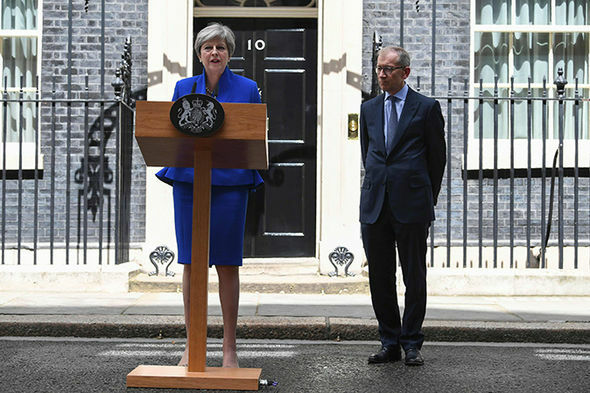 I am pretty certain,however, that the sudden decision to propose an election,was not taken by the PM alone, and she should not be made a scapegoat for the losses of a few tory seats as a prize for regaining the position as PM for the next 5 years,allowing her sufficient time to make agreements with the EU, to the satisfaction of both parties. 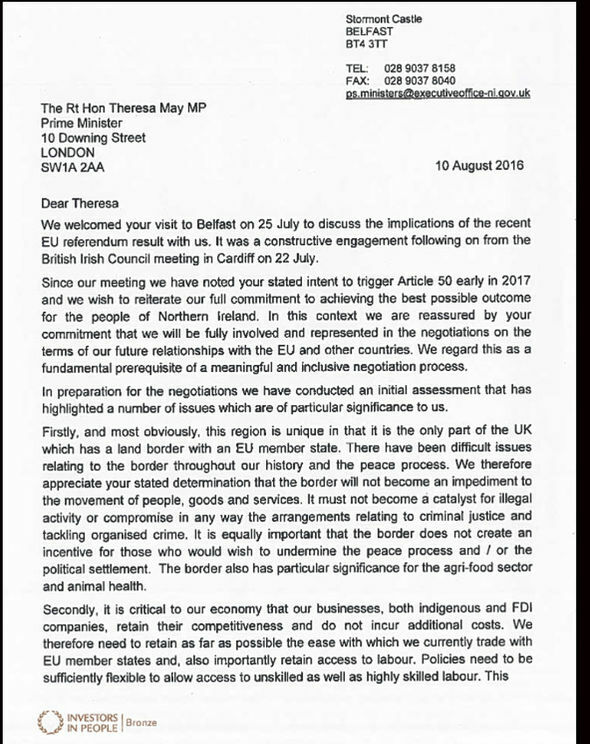 The letter from DUP leader Arlene Foster was written in August last year and is not updated with regards to the exchange of proposals which since has been hurled across the English Channel. Obviously,some agreement must be found to allow neccessesary passage and trade between Northern and Southern Ireland, as well as required labor forces. A way must also be found to replace any legitimate financial support received from the EU,should they cease paying the support. Come on people,don´t destroy all the work and talks which has taken place since Theresa May became PM by creating further problems and demands. All will be considered as soon as our REAL talks can begin. The REAL world ALWAYS demands a fair bit of give and take!